This is a great dish to sit down to after coming in from the cold of North Carolina in November. 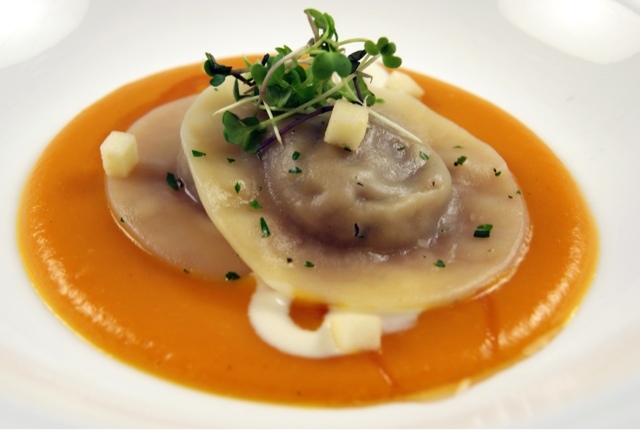 It consisted of ravioli with a filling of duck confit ragout, a puree of roasted apple and sweet potatoes finished with cream and was garnished with tart apples, creme fraiche and a bourbon and apple cider gastrique. The duck legs and thighs were allowed to air dry for 45 minutes in a cooler. Combine two cups of kosher salt with two tablespoons of fresh black pepper, three teaspoons of minced shallot, one teaspoon of grated orange zest, four bay leaves and ten sprigs of fresh thyme. The duck thighs should be liberally seasoned with the mix and allowed to cure for four hours. Then rinse the mixture off the duck and allow to air dry in the cooler for another thirty minutes. Sear the duck legs in a hot pan, skin side down first, then flip the duck when it has a nice crust and has browned. Place the duck in a single layer in a hotel pan and cover with duck fat, adding fresh thyme, bay leaves and black peppercorns. Roast at 225 degrees until the duck reaches an internal temperature of 180 degrees. Remove from the oven and allow the pan to cool. Remove the legs from fat, then remove the skin from the thigh and legs, then remove meat from thigh and leg bones. Make sure not to leave any tendons with the meat. Lightly shred the meat and reserve in the cooler. The next day, poke a hole in the cooled, solid duck fat and allow the duck stock to drain into another container and reserve. Mince one half cup of fresh shallots, finely chop one half bunch of flat leaf parsley, finely chop one teaspoon of fresh thyme, finely chop one half teaspoon of fresh rosemary. Melt four ounces of duck fat in a large warm saute pan and add shallots. Deglaze with six ounces of port wine, then add thyme and rosemary and reduce the port by two thirds. Add twelve ounces of heavy cream and begin reducing over medium-high heat. Add the shredded duck confit to cream and continue reducting until cream begins to thicken. Add four ounces of demiglaze and continue to reduce. Add one half of a wheel of boursin cheese and stir in the parsley. Season to taste with kosher salt and freshly ground black pepper. Posted in Appetizer, Game, WinterTagged apple, confit, duck, ravioli, sweet potatoBookmark the permalink. 2012 International Culinary Olympics Archive is Complete!